Show you are a master rebuilder with THE LEGO MOVIE 2 70831 Emmet’s Dream House/Rescue Rocket! This 2-in-1 rocket house features Emmet’s home which can be rebuilt into a rocket. The house toy opens out for easy interior play and has a detailed living room/kitchen and attic. Remove the roof and use parts from the water tower and barricade to create a rocket with spring-loaded shooters and adjustable engines. 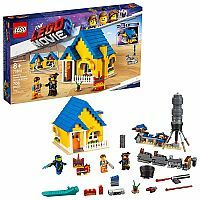 This fun building toy includes 3 minifigures, plus buildable Planty and Unikitty as Warrior Kitty figures with weapons and accessories to role-play action from THE LEGO MOVIE 2. Emmet, Lucy and Rex minifigures, plus Planty and a Unikitty as Warrior Kitty figure.